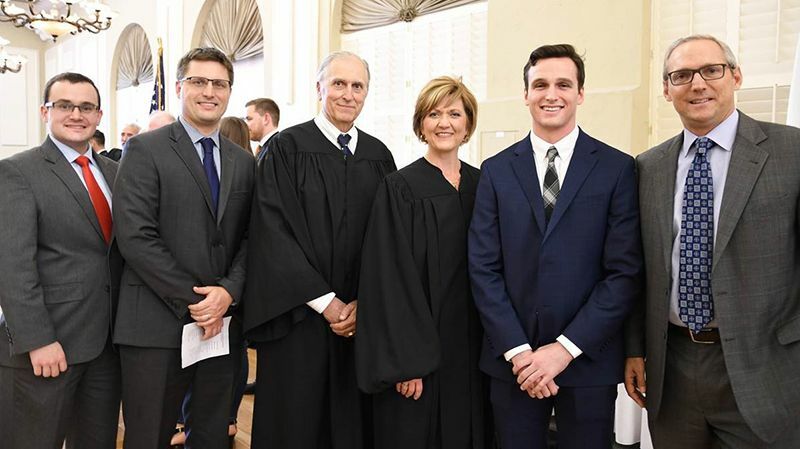 On November 8, 2018, the Law Firm of Spesia & Taylor welcomed its newest attorney, Jonathan W. Powell, to both the firm and the Illinois Bar. 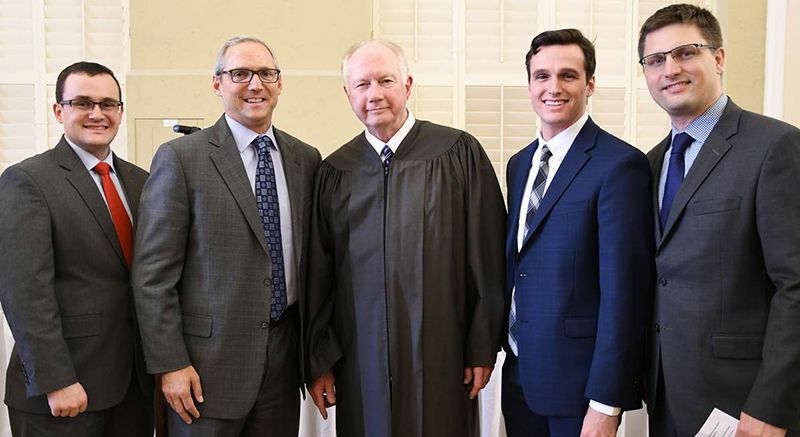 From left to right: Associate Michael A. Santschi, Partner Christian G. Spesia, Illinois Supreme Court Justice Thomas L. Kilbride, new Associate Jonathan W. Powell, and Associate Jacob E. Gancarczyk. The swearing-in ceremony was an intimate affair hosted by the Illinois State Bar Association at the Joliet Renaissance Center. The Joliet Police Department’s Drum and Bugle corps provided a grand and exciting opening to the ceremony and the Will County Sherriff’s office presented the colors before 29 candidates for admission swore their oaths of attorney. Dignitaries from the Illinois Supreme Court, the Illinois Third District Court of Appeals, the 12th Judicial Circuit of Will County, and the Illinois and Will County Bar Associations were in attendance. The speakers at the ceremony included Justice Thomas L. Kilbride (Illinois Supreme Court), Justice William E. Holdridge (Illinois Third District Court of Appeals), and the Honorable Richard C. Schoenstedt (Chief Judge, 12th Judicial Circuit of Will County). Spesia & Taylor Attorneys pose with Third District Appellate Court Justices William E. Holdrige and Mary K. O’Brien after the swearing-in ceremony.